Over the holidays, I worked hard to update and improve and then launch 2 new and improved courses. 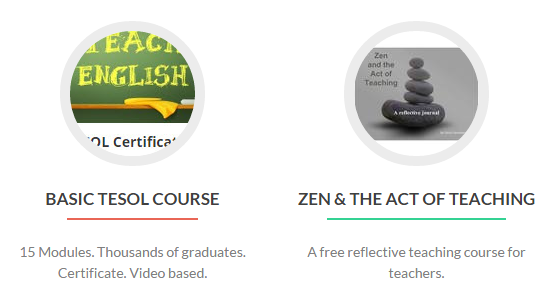 The Basic TESOL Certificate course and a reflective teaching course – Zen and the Act of Teaching. The certificate course is paid. Very low price, lifetime access to all materials. Complete the 15 modules and get your certificate. It’s that easy! The course has been dramatically improved, many new materials added. In the last iteration of the course, over 2,000 teachers paid and completed this review course. The course will remain open as a page on my teacher communities but students will have to pay or become an EFL Classroom 2.0 paid member to get the certificate and letter of confirmation. The reflective teaching course is free and open to all teachers. Based on my book: Zen And The Act Of Teaching, it is meant to be used/assigned by teacher trainers to get trainee teachers to reflect on their teaching experience and expectation and share their own thoughts about teaching. I hope many organizations, schools, will take advantage of this complete reflective teaching course. During 2016, I’ll be adding courses for both teachers and students in this new home for all my courses.